Mechanical science and engineering professor Harley Johnson, left, and graduate student Brian McGuigan look to a common optical phenomenon for inspiration in electronics design. CHAMPAIGN, Ill. — The phenomenon that forms interference patterns on television displays when a camera focuses on a pattern like a person wearing stripes has inspired a new way to conceptualize electronic devices. Researchers at the University of Illinois are showing how the atomic-scale version of this phenomenon may hold the secrets to help advance electronics design to the limits of size and speed. 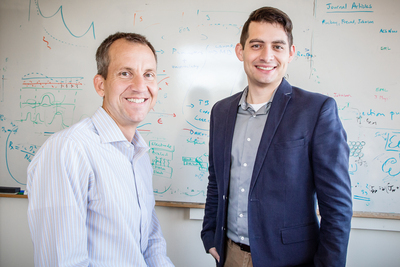 In their new study, mechanical science and engineering professor Harley Johnson and his co-authors recast a detail previously seen as a defect in nanomaterial design to a concept that could reshape the way engineers design electronics. The team, which also includes mechanical science and engineering graduate student Brian McGuigan and French collaborators Pascal Pochet and Johann Coraux, published its findings in the journal Applied Materials Today. On display screens, moire patterns occur when the pixelation is at almost the same scale as a photographed pattern, Johnson said, or when two thin layers of a material with a periodic structure, like sheer fabrics and window screens, are placed on top of each other slightly askew. At the macro scale, moires are optical phenomena that do not form tangible objects. However, when these patterns occur at the atomic level, arrangements of electrons are locked into place by atomic forces to form nanoscale wires capable of transmitting electricity, the researchers said. For decades, physicists observed microscope images of atomic arrangements of 2-D thin films and recognized them as periodic arrays of small defects known as dislocations, but Johnson’s group is the first to note that these are also common moire patterns. “A moire pattern is simply an array of dislocations, and an array of dislocations is a moire pattern – it goes both ways,” Johnson said. This realization opened the door to what Johnson’s group refers to as moire engineering – what could lead to a new way to manufacture the smallest, lightest and fastest electronics. By manipulating the orientation of stacked layers of 2-D thin films like graphene, wires of single-atom thickness can be assembled, building the foundation to write nanocircuitry. A wire of single-atom thickness is the limit of thinness. The thinner the wire, the faster electrons can travel, meaning this technology has the potential to produce the quickest transmitting wires and circuits possible, the researchers said. In the meantime, Johnson’s group is focusing on types of devices that can be made using moire engineering. A Fulbright U.S. scholarship, the Universite Joseph Fourier, the National Science Foundation Graduate Fellowship Program and the French National Research Agency supported this research. To reach Harley Johnson, call 217-265-5468; htj@illinois.edu.